View the conversation below at your own risk…There is almost but not quite the king daddy of all potty words in there…But the conversation totally sums up day two of ISTE. It all started with a very interesting session over Project Based Learning hosted by Suzie Boss and Mike Gwalty. It was excellent and got my brain all buzzy with ideas. Different ways to try to get the students to discover more on their own and learn what they are interested in, and by the way it also relates to math…next up was a super energetic session using the SMARTBoard. I am fortunate to have this wonderful piece of equipment in my room, but wanted to see if there were any new tricks (always look for new tricks) and I got some!! Success again!! My compatriot in crime and I sprinted to Mcdonald’s for a super quick to-go meal and were just barely late to the next session…This was where we were when the following conversation took place. She went to see how iMovie could be used with iPads, I went to see how Google Earth could be used in math (we are both math teachers…). I was enjoying some really cool ways to use Google Earth and also trying to figure out how to use it for my classes. 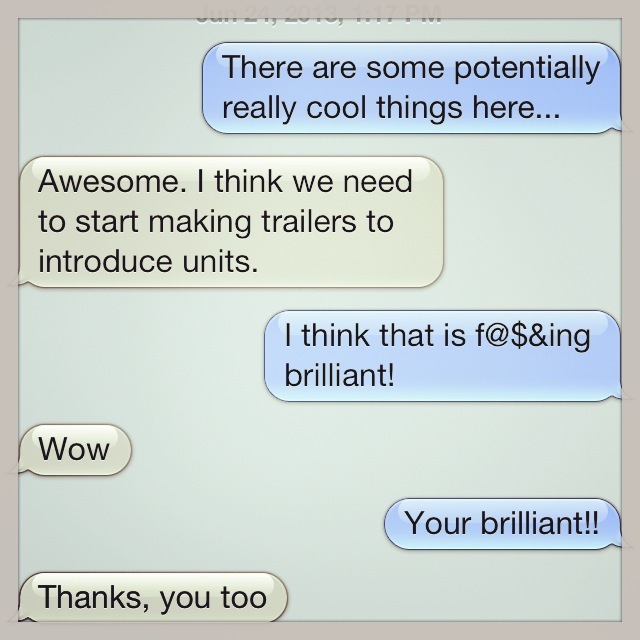 I text her about the potential for some cool things that could come from this session….She replies with “I think we need to start making trailers to introduce units.” This was out of left field and hit me like a train crushes anything unlucky enough to be in its way!! What a great idea, build up some suspense, create an atmosphere of anticipation….we had several ideas written down before the end of the day. We both capped the day off by listening to the pioneers of the flipped classroom: Jon Bergmann and Aaron Sams. Since I have gone to this model, it was a great thing to hear them and see the steps that they have taken. Again more great ideas bouncing in my head…I need a good old fashioned Harry Potter pensieve to refer back to later!!! Kristina and I have burned up Evernote and blazed through Google Docs (which we discovered we could both edit the same document at the same time…on different pc’s…we blew our own minds). Day 2 is next….what will it hold? ?